Registered users can be informed about release of any new version of PragTic thanks to the Notification system. The proposition to include them to the e-mail list is shown at this place whenever they are logged in. Dec 31, 2017: We are finishing the project GA15-18274 today. As a by-product of this primary research effort, the PragTic was parallelized. This special version anyhow goes with completely different mode of operation. If you are interested in it, follow please this link. New calculation methods for fatigue limit estimation, e.g. Kakuno-Kawada, various methods implemented in NASALIFE, etc. Improved solution by PCr method, new PDS method, new PQ method - all proprietary methods intended for fatigue strength estimation. New PCr method provides results, which are better than any other method available in PragTic or published elsewhere. Extended use of own macro language built in such a way, that the same commands can be then used also by the commercial version of PragTic. Thanks to macro language, e.g. preparing the transient stress-strain history can be largely speed up. Number of load channels increased to 128. Import of own data format *.pti and export into *.pto format realized. Routines for Abaqus and Ansys to prepare the *.pti files available. Possibility to run rain-flow analysis separately, without the complete fatigue calculation. Preparing rain-flow matrices from load spectra on demand, with default or user defined ranges. Add-on low-cycle fatigue module with extensive set of 20 various LCF methods. The commercial version was developed during the FADOFF project as well, but the first licence is planned to be publicly released by the end of 2015. If interested, contact us please. PragTic in the freeware version is intended just for research purposes. It is not expected to be used for any commercial computation and if it is used in such a way, it is on your own responsibility. Please, if you find a bug, just write me, how it occured. If you are a registered user, you can use the on-line system of bugs reporting in Bugs section. If you would like to use PragTic, you are required to become an official user (either privileged user or anonymous user). You can choose the form of your account after you click on the Download Entire Program button below. Because the Database of Fatigue Limits requires some knowledge over the methods used for calculation of results gathered there, the Help file of PragTic can be downloaded without any registration. Full import of MSC.NASTRAN data through *.dat, *.nas and *.pch files. Import of a native *.pti ASCII file, for which routines for Ansys and Abaqus are available. Reading of nearly any ASCII FE-data observing relatively common formatting rules - this feature is usable for solid elements only. Output of solution to a spreadsheet form (readable e.g. in MS Excel), to the FEMAP neutral file (*.neu), to Ansys, or to a native *.pto format. Performing a fatigue calculation either on FE-results (at nodes, nodes of elements, elements) or at isolated points without any relation to the FE-model. Preparing the multiaxial solution, i.e. relating more simultaneous load channels. Accessing (viewing/editing) the input/output data of calculation directly inside the program. Filter for selection of data desired for viewing. Tools section producing details on FE-models topology, results, etc. Computation by many high-cycle fatigue methods (Findley, Papadopoulos, McDiarmid, Zenner & Liu, Crossland, Sines, etc.) and low-cycle methods (8 uniaxial ones, Wang-Brown, Socie et al. from the multiaxial methods). Unique solution by PCr method designed by myself concerning the computation towards the fatigue limit - check its interesting results in the FatLim database. S-N curve based LESA method derived from the Eichlseder's gradient method and FKM guideline as implemented in FemFat. 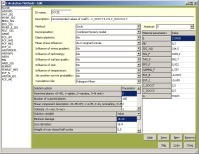 Control over the broad range of all the methods' parameters. Ability to run the computation by several different methods simultaneously. There is no way how to introduce plasticity to an elastic FE-calculation except for the uniaxial methods (where the Neuber's and Glinka's methods are available). The only solution here is to prepare the transient analysis using the non-linear FEM-results in different time instants. No intern visualiser - upload of result data back into the FE-utility is expected. Input of finite elements was tested only on most typical element types of ANSYS, ABAQUS and COSMOS. The only nearly fully implemented FE-package import is that one from MSC.NASTRAN. Further element types (or even upload of particular FE-data) can be implemented on your request. The help file of PragTic v.0.2 has not been wholy completed. Its state corresponds to the version PragTic v.0.2betaH. Here you can find two basic tutorials concerning the installation and use of PragTic. If interested you can follow them also in Czech. Thanks for preparing the tutorials belong to Radim Halama from the Technical University in Ostrava!